Mr.Graham Thorpe (Former english batsman) has suggested Rahul to retire from international cricket. 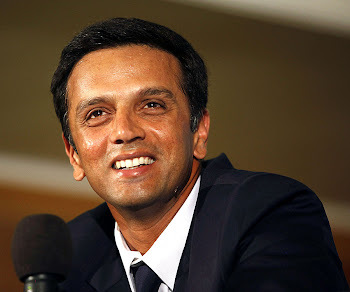 "Hopefully Dravid will know that he is well past his best and not let his pride get in the way. He should accept that he has had a good long international career and make life a bit easier for coach Gary Kirsten rather than waiting for the tap on the shoulder to say 'thanks for everything'. It certainly won't be an easy decision for Kirsten because we all remember what happened when one of his predecessors Greg Chappell tried to get rid of Ganguly. These players are icons and the backlash eventually saw Chappell fall on his sword and Ganguly get back into the side. I don't think in the UK we fully understand in what high esteem these players are held. From personal experience I know that deciding when to hang up your boots is the toughest decision in the world. Sourav Ganguly has decided to end his career after India's current series against Australia and I think Rahul Dravid should follow him. He is now really grinding out the runs like the way I was at the end of my career. You have to admire his strength and his courage to stick it out but he is not showing any of the fluency that has seen him score over 10 thousand runs at an average in excess of 50. Old Father Time also seems to be catching up with Anil Kumble as well. He didn't take a wicket in Bangalore and then missed the second Test in Mohali with a shoulder injury. His body is letting him down and it's getting tougher for him with injuries. One Test is a little too early to say that the young leggie Amit Mishra can instantly step into Kumble's shoes but he looks an exciting talent and they need to start bringing some of the younger players in. The last thing Kirsten wants is for four or five guys to all retire at the same time and he needs a gradual changing of the guard. Guys like Gautam Gambhir have been around for a little while now and have done a good job. But I think Sachin Tendulkar and VVS Laxman still have some mileage in them. They are playing well enough to stay on and could cause England some problems again this winter." I think Rahul has been quite unlucky for many of the matches he played recently.He has got the starts, but failed to convert them into biggies, thanks to bad-luck and poor umpiring.Though he has not got many runs for over an year, he still has a lot to contribute which he is capable of. well i saw ur blog 2dayand also i'm a good fan of Dravid.